The third installment of our three-part series commemorating the 100th anniversary of the Great War is now on display in the Msgr. William Noé Field Archives and Special Collections Center, and will remain until 30 April 2015. This final phase of the exhibit demonstrates the changes that had taken place by the end of the war. Figurines depicting German and British infantry show that despite the technological advances of the war, foot soldiers remained key on both sides. 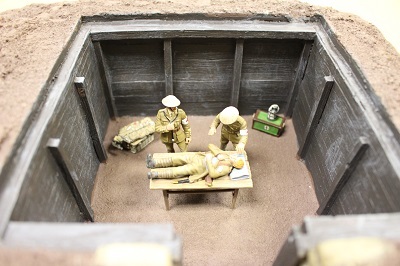 Dioramas and models show the state of medical facilities and care of the wounded, as well as the contribution of women to the war. Figurines of U.S. infantry and marines highlight U.S. involvement in the WWI. Antique “dime store” toy soldiers made of hollow-cast lead, which became popular after the war, are displayed alongside modern figurines and models. We continue to display rare books from the Archives, which feature photographs, illustrations, and poetry inspired by WWI. The exhibit can be viewed any time the Walsh Library is open, in the display cases across from Walsh Gallery.